March is National Developmental Disabilities Awareness Month. 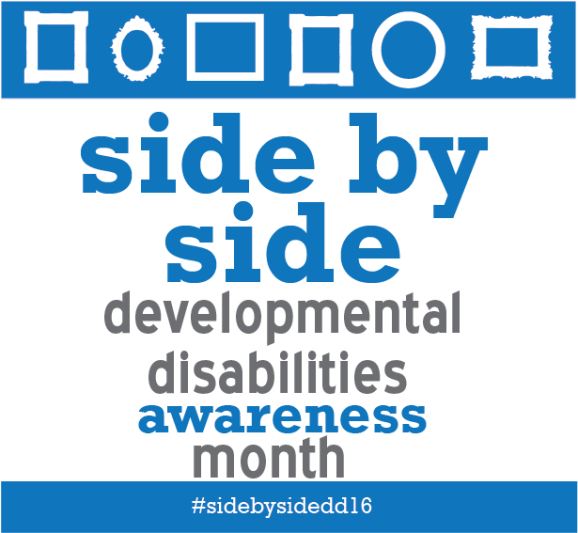 In an effort to spread awareness about developmental disabilities, the National Association of Councils on Developmental Disabilities (NACDD), Association of University Centers on Disabilities (AUCD), and National Disability Rights Network (NDRN) are partnering to launch a social media campaign (Side-by-Side) to highlight the many ways in which people with and without developmental disabilities come together to form strong, diverse communities. The campaign seeks to raise awareness about the inclusion of people with developmental disabilities in all facets of community life, as well as awareness to the barriers that people with disabilities still sometimes face in connecting to community life. Step 1: Share and post the social media calendar on your social media accounts! This calendar is full of resources, toolkits and links to interesting media regarding inclusion. Upload a link to the calendar on your social media or post links from calendar daily to promote inclusion in the community! Step 2: "Fill the Frame" Encourage your followers to share pictures, videos and stories on social media that reflect people with and without developmental disabilities living, working and playing side-by-side in the community. Need some help thinking of ways to use the calendar in your social media? Check out this guide for some tips and tricks or listen to this recorded webinar!